In college after watching Harold and Kumar Go to White Castle, my roommates and I all considered driving to the closest White Castle (which was in either Ohio or New Jersey) at 2am just to taste these burgers so desired in the movie. Post-college, I helped move my brother out of his apartment and then we roadtripped from Arizona back to Massachusetts and intended to try all the cheesy things along America's highways, and that included fast food rarities. Just outside of St. Louis we were finally going to try White Castle. We ordered our sliders, ordered the fries, piled into the car, and ripped open the bag to finally try this legend. Spoiler alert: they are horrible. Reeking of onions with the texture of rubber, it was the biggest waste of $15 ever. Needless to say we did not finish the meal and, being the crazy kids we were, the sliders were then thrown at said White Castle and we drove up the street and ate at Burger King. I like to get all my hot headlines in the morning and almost puked in my mouth when I read this gem: White Castle is putting out a candle for charity. Yes, a White Castle scented candle to fill your home with the aroma of ground beef and onions. I think I puked a little bit in my mouth just writing that. I can't imagine who wants this smell permeating their house on a constant basis. The only thing you should be happy about is that it only smells of the burgers and not the nasty chlorine covered floors which they have to clean constantly because I bet it's covered in slider vomit. Seriously folks, would you rather sit in a home smelling of cinnamon apples, vanilla, or White Castle sliders? Oh god, I think I'm going to be sick again. Well folks, if you have a charitable heart and a strong stomach, keep an eye out for this candle. Me? I think I'll just stick to your basic sugar cookie or perhaps peach cobbler candle. i think you have just had a bad white castle experience. or maybe not. i'm pretty sure i've only had them after drinking - so the jury is still out. 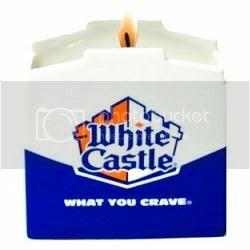 but a white castle candle? oh honey. NO. I've only been to White Castle once, and I found it to be OK. Then again, I don't mind rubbery burgers, and I love onions, so they were pretty swell to me. We did also order chicken rings though, and they sucked; they were like bad onion rings, made of chicken.